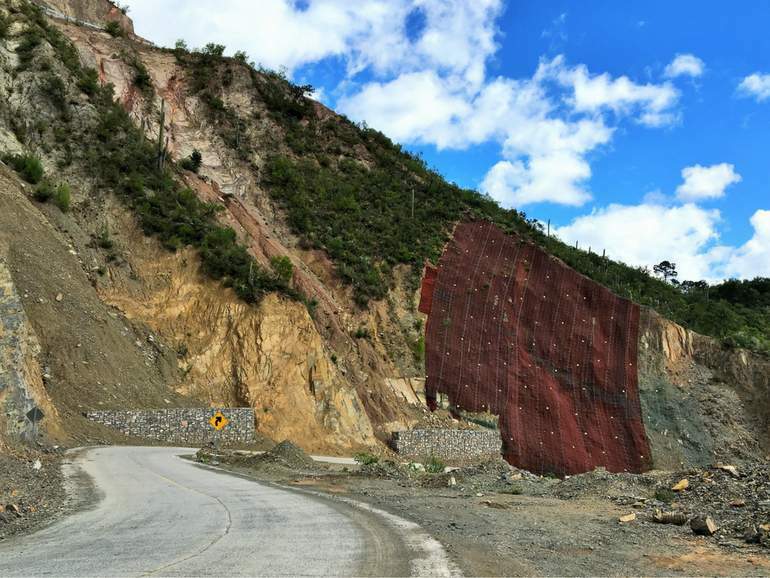 Maccaferri Mexico proposed two solutions within the Cardonal-Arenalito road improvement scheme in Hidalgo: a hydraulic works solution was needed at km 0+300 to protect a culvert and the embankment from erosion and a rockfall mitigation solution at km 0+900 was necessary to protect vehicles from falling debris. Mexico’s Secretariat of Communications and Transportation (SCT) launched a road improvement scheme for the modernization of the Cardonal-Arenalito road, in Hidalgo. The winding mountain road needed widening and straightening, all with a new pavement surface. Among the work that needed to be carried out to improve road safety on the Cardonal-Arenalito road, was the restoration of a culvert passing under the road at km 0+300. Erosion caused by the river had displaced the embankment, resulting in a deep fracture of the concrete slab above and part of the road pavement. Another intervention was required at km 0+900, where a large amount of debris was repeatedly falling on the road from the right slope, presenting a hazard to passing vehicles. for the protection of the culvert, we proposed a gabion structure to control river erosion and safeguard the embankment. The construction of an additional retaining wall in the upper part of the slope was proposed to avoid the displacement of the embankment caused by wind and rain. for the rockfall mitigation solution at km 0+900, we proposed a combination of reinforced gabions and Rock Mesh B600, complemented with our geomat MacMat. Rock Mesh is the result of integrating 8.0mm diameter steel cables placed longitudinally (RockMesh MO), or in both directions (Rock Mesh BO), with our double twist hexagonal steel wire mesh. RockMesh is a single-layer geocomposite product making on-site handling and installation simple and quicker, which can lead to cost savings. MacMat geomats are erosion protection mats engineered from polypropylene monofilaments, tangled together to form a highly deformable 3-dimensional layer 10-20 mm thick. It features a very high porosity (greater than 90% on average) and are used on slopes to immediately increase the soils resistance to erosion and by providing an environment that enhances the growth of vegetation through the mat. For more information about this project, download our case history.